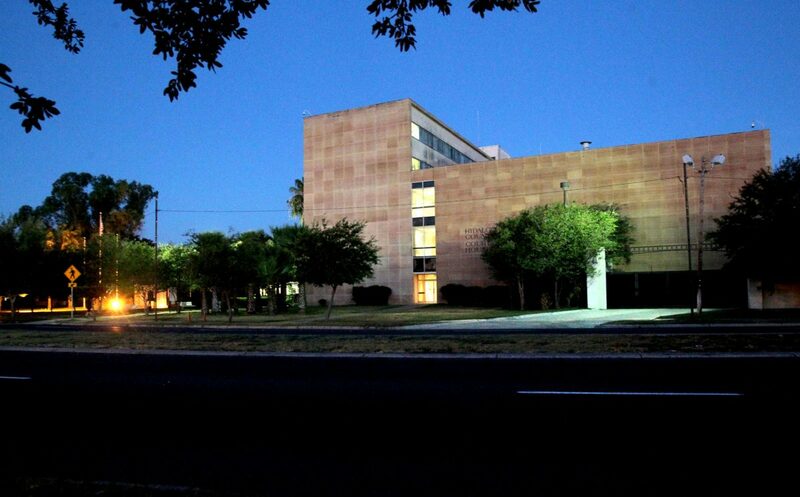 Hidalgo County Courthouse seen on Friday, August,24, 2018, in Edinburg. EDINBURG — Hidalgo County Judge Ramon Garcia and company traveled to New York last week to borrow $127 million for the construction of the new courthouse. Garcia — accompanied by Hidalgo County Budget Officer Sergio Cruz, Hidalgo County Executive Director Bobby Villarreal and financial adviser Noe Hinojosa — sold the bonds Monday during what county officials described as a turbulent market day, but the group managed to walk away with a lower interest rate for the courthouse project than Hinojosa calculated, which saved millions in taxpayer dollars, Garcia said. “We got an excellent grading and extremely good interest rates — to the point we were able to save $12.2 million from the amount that was (previously) proposed by the financial officer,” the county judge said Friday. In his conservative calculations, Hinojosa expected the interest rate for the courthouse to land somewhere between 4 and 4.5 percent, but the county was able to obtain a true interest cost of 3.99 percent over a 25-year period for the $127 million it borrowed for the project, Cruz said. In reality, Hidalgo County borrowed a total of $177.7 million in three separate transactions — $127 million were borrowed for the construction of the new courthouse, $27.5 million for a slew of capital improvement projects and $23.2 million to refund a prior issuance, the budget officer said. Each issuance obtained a different rate and were set to be repaid over different periods of time. The county obtained a true interest cost of 3.61 percent over 20 years for the $27.5 million it will use to improve streets and drainage and a true interest cost of 4.05 percent for the $23.2 million it will use to refund a prior issuance. Hidalgo County commissioners have yet to obtain a guaranteed maximum price for the construction of the courthouse, so they relied on an estimate from Jacobs Project Management, the program manager. “Jacobs has a very good feel for what that number will ultimately be, but we don’t have it yet,” Garcia said about the building’s price tag. County officials will have to borrow money once again once the building is completed to pay for its furniture, fixtures and equipment.